Astrophotography today is becoming more and more about taking a series of individual images and assembling them into something else. This can be done in two sorts of ways. Very often, astophotographers will take repeated shots of the same area of the sky, and then use software to “stack” them, which has the effect of greatly reducing noise in the final image. As many of the objects in space are extremely faint, long, noise-free images are necessary to find them at all. It’s also possible to make images of large areas of the sky by taking individual photos and joining them together, or stitching them. This can be a very effective way of using small cameras to produce large, high-resolution images. Despite the trend in some circles of seeking ever-bigger sensors dSLR cameras, stitching means that small cameras – like a web cam – can be used to great effect. On the night of 16 August 2013 I was doing some observing and photograph form my west-facing balcony in Hamilton, and decided to try to make a large portrait of the moon using a small camera. I tried imaging the moon with several different cameras that night. My telescope was my Meade 125 Terabeam Maksutov Cassegrain catadioptric telescope mounted on an EQ6Pro mount with Synscan. Because of my balcony’s situation, it’s impossible to do an actual polar alignment; I can’t see Polaris. I can get to within a degree or so, which is good enough for taking a few images of bright objects like the moon. The moon was lovely that night. 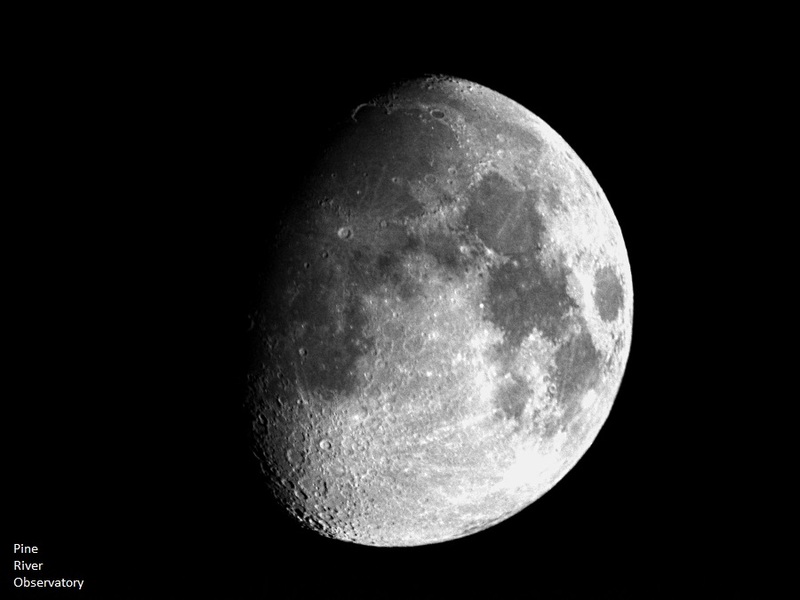 After a few minutes of general moongazing, I mounted a Nikon D800 body on the telescope at prime focus, and was able to capture images of the whole moon’s face in one shot. A photo of the moon taken on the evening of 16 August 2013 from an apartment balcony in Hamilton, Ontario, using a Nikon D800 camera on a 125mm Maksutov Cassegrain catadipotric telescope. I then changed the camera, replacing the big dSLR with a little imager sold specifically for lunar and planetary imaging, a Celestron NexImage 5. This little camera looks like a miniature hockey puck about 2″ across. Inside is a 5 megapixel colour image sensor, which attaches to a computer via a USB cable. In contrast to the very expensive Nikon camera, the NexImage 5 retails for under $200. 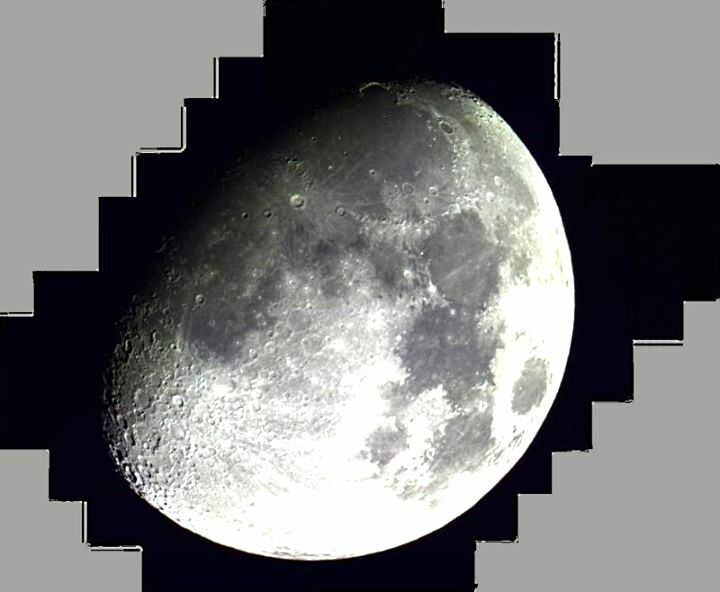 Because the pixels are quite small compared to the dSLR, it is able to record images of much higher resolution on subjects like the moon, for a given magnification. It is able to do a variety of things, including recording AVI video files that can be used in the stacking process. 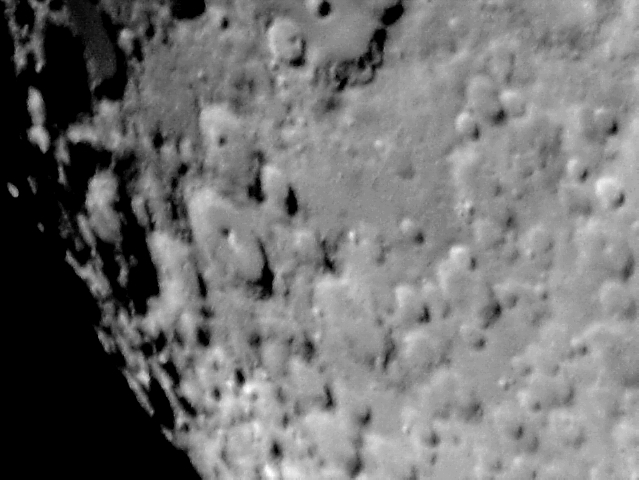 One image captured by the NexImage 5 camera, including the famous craters Tycho and Clavius. I decided to try making an image of the moon using single exposures with the NexImage 5. I set up the telescope to point at an area along the terminator of the moon, took a single image with the camera, and then manually moved the telescope so that it was pointing to an area that overlapped the first image by about 30 percent. In this fashion I worked my way across the entire surface of the moon, taking 41 individual images. Having the pictures recorded was just the first step. The camera software had recorded the pictures as bitmap files (*.bmp), and so I used a free image processing software to convert them from bitmap to JPG files. I then used another free software package called Autostitch (downloaded free for personal use at: http://www.cs.bath.ac.uk/brown/autostitch/autostitch.html) to automatically bring all of the JPGs together, align them, and blend them together. I ran the program first on about a dozen overlapping tiles to see if it would work at all: Autostitch is designed for landscape photos – not moonscapes! 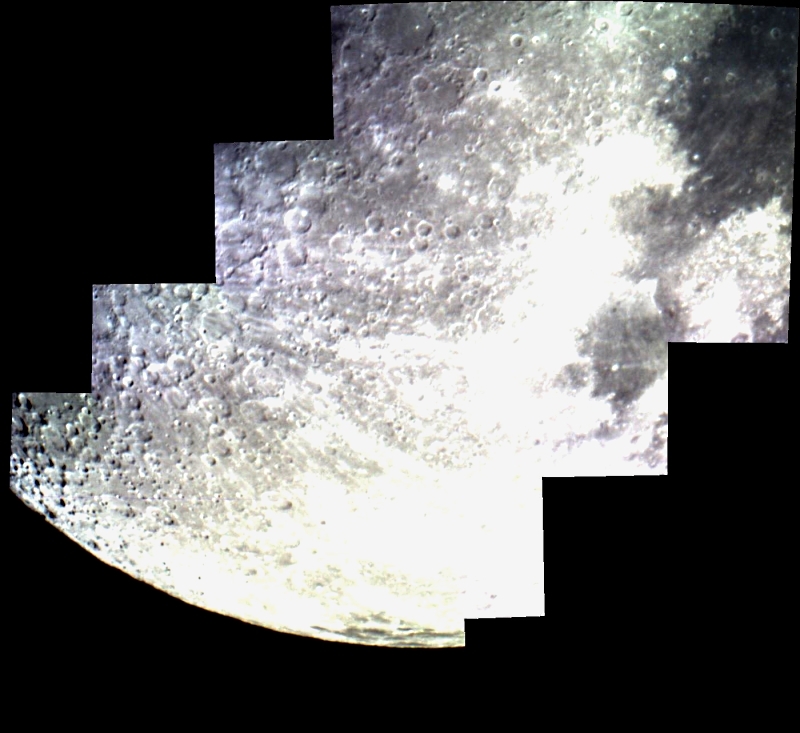 A section of the lunar panorama made by using Autostitch to put together a dozen individual tiles. Autostitch performed better than I could have hoped on my lunar frames! I re-ran the program using the whole set of 41 tiles, and in moments had my portrait of the moon in high resolution. 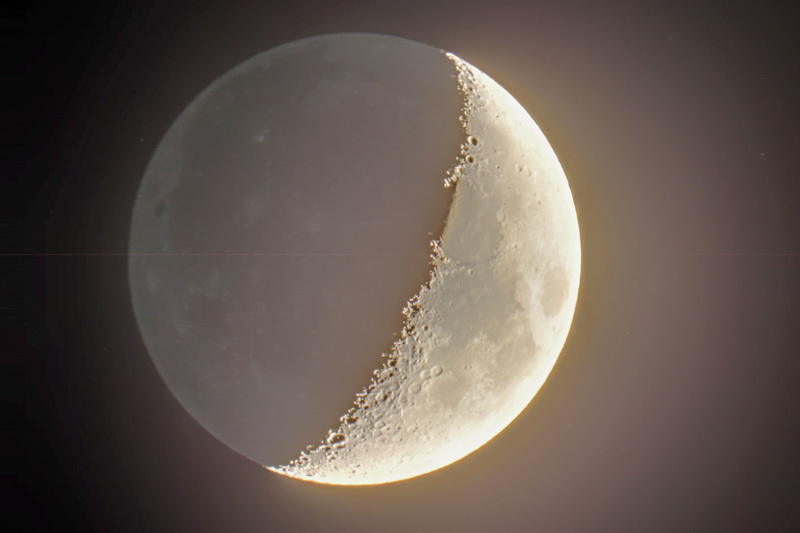 The moon, stitched together from 41 individual frames using Autostitch. The final stage in assembling the image was to fill in the grey areas that were not actually captured by the imager. I used another free software package, Paint.NET (not as capable as Photoshop but a whole lot less expensive!) to adjust contrast and brightness a bit, and paint in the grey areas with black. The results would be even better if each of the tiles had been prepared by the stacking process, which can result in dramatic improvements in such images. For now, I’m happy with yet another photo of the moon! 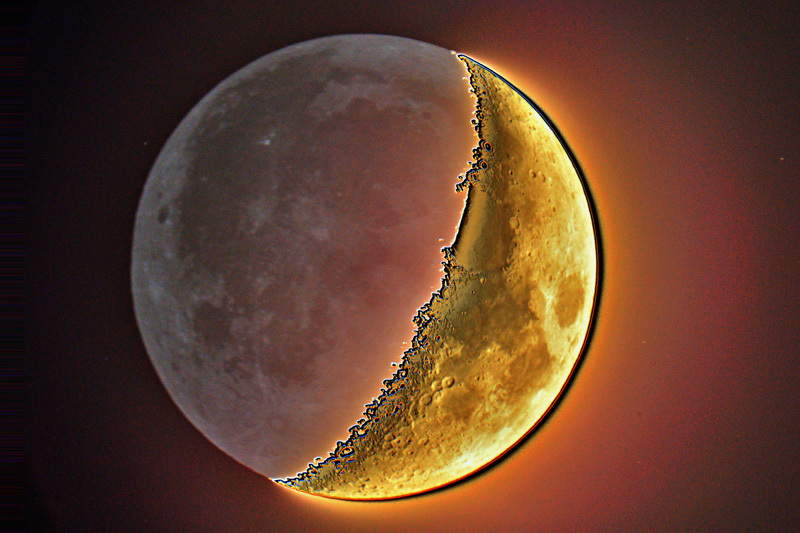 The final composite image of the moon, captured on 16 August 2013. Can Astrophotography be Considered Art? The debate as to whether photography can be an art – or whether (at least some) photographs are art – has been long standing, and in some circles doesn’t end. The fact that there is some kind of equipment involved, and a process that wasn’t available in Renaissance Times to the great masters, seems to be a sticking point for some. For those that only consider art to be a handicraft executed with traditional materials, astrophotography must seem like arcane technical fiddling resulting in – what? A picture of the moon or stars? How is that art? That there are now about a trillion photographs per year being taken around the world, most of them with cell phones, doesn’t help resolve anything, I suppose. Then again, art is not about a set kind of process or a formulaic end product. It can’t be. Otherwise, the skillful application of a paint bush to the side of a barn is art just as is the Mona Lisa. Defining what is and isn’t art isn’t a matter of technology applied. At least in my mind, art is a process of communication in which thought and creativity are combined to express something of meaning. This is of course very open-ended, but in my experience there’s little more specific that can be brought together in one short definition that fits the range of artistic expression I see around me. Art isn’t just about a defined product, because that removes the receptive mind of the person experiencing the art from the equation, too. The receptive, critical mind of the observer/audience is as important to defining art as is the creative, skillful, intent of the artist. This is nearly as vague as stating that “art is what an artist does or makes,” but even this second idea isn’t all that far off the mark. Who is an artist? Is someone who has great technical skill but does not apply any critical thought to their work, or who never puts that work into the sphere of a receptive audience, an artist? I’m not sure, of course. An interesting case in point is that of the late American street photographer Vivian Maier, who is being recognized as an amazing artist, but only after others found her work and popularized it. Was she an artist? A hobbyist? An obsessive-compulsive photo-snapper hoarder? Some photographers have rejected the idea that they are artists. One of the greatest living photographic masters, Sebastião Salgado, is a Brazilian photographer whose work is considered as social documentaries. He has stated that he doesn’t think he makes anything new, but instead picks up things around him to tell stories. Yet, when I see his work I am moved, and his work has the qualities I identify as art: great creativity, expression of ideas and passion, and technical mastery. For me, an artist must bring some measure of all of these things together, regardless of the medium being used. I call Salgado an artist even if he is reluctant to do so. “I don’t know art but I know if I like it,” or perhaps more honestly, “I don’t know how to define art, but I know it if I see it” might be closer to the mark. And perhaps more honest, too. I am certainly prepared to dispense with the question of whether a photograph can be considered as art. More than anything else, it depends on who is looking at it. 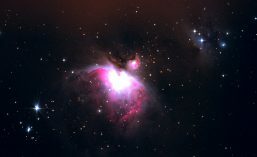 One point in favour of the proposition that astrophography can be an art was provided in 2012, when an art museum in the USA put on an exhibit of astrophotographs as art. This step – of having a curated exhibit at a museum – is one of the only widely-recognized measures of whether something that may previously be considered “not art” suddenly makes the jump into the “art” sphere. “Starstruck: The Fine Art of Astrophotography” (http://www.bates.edu/museum/exhibitions/past-exhibitions/2012y/starstruck/) was an exhibit at the Bates College Museum of Art (Lewiston, Maine, USA), on exhibit from 8 June 2012 through 15 December 2012. This is the first instance of which I am aware that an art museum has taken on astrophotography specifically as art. Others have approached the question, too. Russell Corman considered on his blog whether astrophotography is art or science (http://www.rc-astro.com/resources/art_or_science.html), and describes what he does as a “very technical art.” (http://www.rc-astro.com/about.html). Interestingly, I would argue against amateur astrophography for creative purposes as being science. For me, science isn’t just the application of technology for some activity. Science, like art, is a process that results in interaction with a community, and with the communication of scientific results in a way that the community understands and recognizes. It may be educational, fascinating, and highly technical, but if an activity doesn’t put results into a peer-reviewed journal, for me it’s not exactly “science” either. There certainly can be amateur scientists (Darwin was one), just as there can be amateur artists (most, in fact, are, by definition: someone who does what they do for the love of it, not because it’s a regular 9-5 job). It’s not whether or not you work for some “sciencey” institution that designates you as a scientist – it’s whether you apply the critical thought process of science to a problem that interests you and then disseminate the results so that others can learn what you have learned. I expect that this question will remain an open one, and that’s encouraging and exciting. I don’t consider all astrophotographs as art any more than I’d identify all photocopies as art. However, could a photocopier be used by an artist as part of her work? Certainly. Could a camera and telescope be used by an artist to create an image that was thought-provoking and moving? Yes. Can it be considered art? Show me and we’ll discuss it. The precedent of the Starstruck museum exhibit opens the door in a serious manner. An examination of some of the images that were included in the exhibit is, perhaps, an indication of where the art is to be found in astrophotography. Some of the images available in the on-line material about the exhibit were in fact taken by NASA spacecraft. They were selected and prepared for the exhibit by artists, using a variety of processes and final media. The show also included images considered historically significant that were created for documentary purposes. I recall my dear, late mother’s view of art, too, when I approach questions like this. For her, art was something that represented something she recognized. She loved Pablo Picasso’s early works, but hated his cubism. She even kept a print of his Harlequin on her bedroom wall, not knowing who had done the work until I pointed it out to her. If a work wasn’t a skillful, draftsman-like rendering of something she recognized (and liked), my mom wouldn’t give it the time of day. For her – and for everyone, in reality – the determinant of whether something is considered as art depends on a complex set of cultural expectations and filters. Recognizing that we all have those sorts of filters is an important first step to asking a more difficult question: is my own set of filters keeping me from seeing what others might be seeing? I think that’s where art has one of its strongest roles in society, and it’s where an artist’s contribution is most vital. Bringing things forward that others may not see. In that sense, some astrophotography is art indeed. Nova Delphinus 2013 (left) and planetary nebula NGC 6905 (right), cropped at full scale from the same photograph taken on the evening of 24 August 2013. While I’m generally pleased with the images I took that evening, there is evidence of some problems on this 30 second exposure – the pulled out stars should all be points. More details follow below. Although a lot has been made of two comets passing through our skies in 2013, August has given us an unpredictable and much rarer astronomical event: a nova, visible to the naked eye. 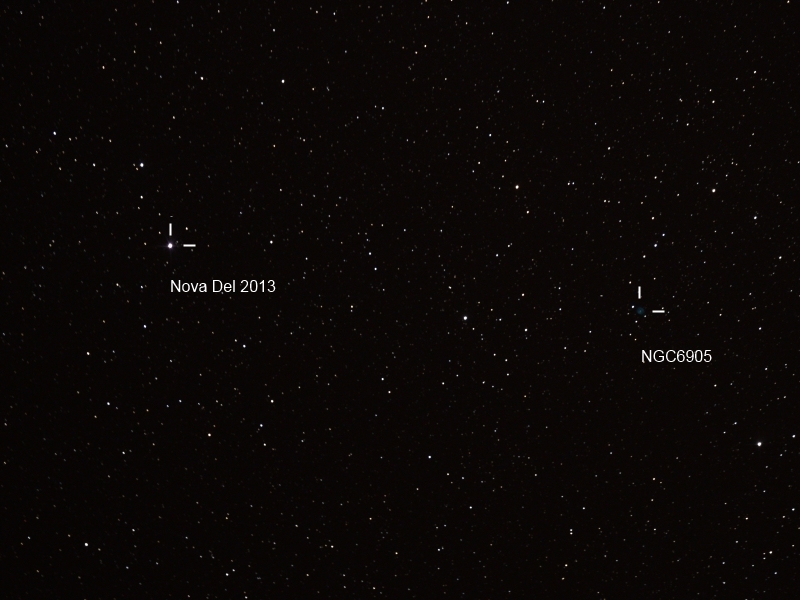 Nova Delphinus 2013 has proven to be the brightest nova in five yeas – definitely worth a look. Novas are fleeting, however. There isn’t much time. 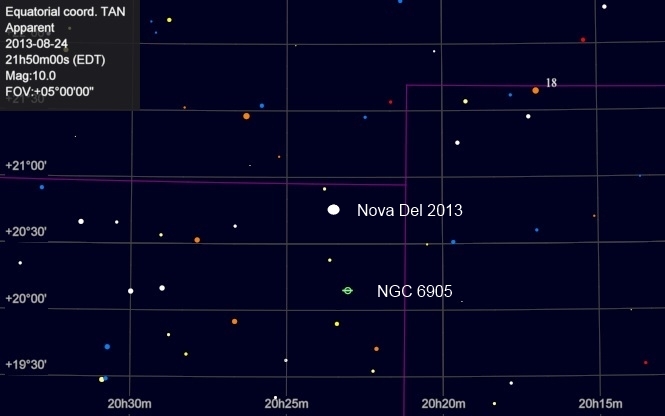 According to Space.com, Nova Delphinus 2013 was discovered on 14 August 2013 by Koichi Itagaki in Japan. Prior to brightening more than 100,000 times in its explosion, the star was a dim little 17th magnitude. It became as bright as 4th magnitude in the days since it was first spotted, and is now fading a bit. Over the coming days and weeks it will fade completely. I set out on the evening of 24 August from our cottage in Bruce County to see if I could see it. Novas are exploding stars, and the initial flash doesn’t last too long. First, I had to find out the coordinates of this transient object. The nova is located in the constellation Delphinus, the Dolphin, not too far from the “tip” of another constellation, the arrow, Sagita. The astronomical coordinates are RA. 20 h 23′ 31″, Dec. +20° 46′. Altair (α Aquilae), at 0.9 Magnitude, in Aquila, is the nearest very bright star. Sualicin (α Delphini), 3.6 Magnitude, in the held of the dolphin, Delphinus, is the nearest named star. A wide-angle chart of the area of Nova Delphinus 2013, rendered with the freeware planetarium program Cartes du Ciel. This chart covers about 30° of the sky. The nova and the planetary nebula NGC 6905 are so close together that I’ve just indicated the nebula here. A narrow-angle drawing of the areas of Nova Delphinus 2013, prepared with Cartes du Ciel. This chart covers about 5°. 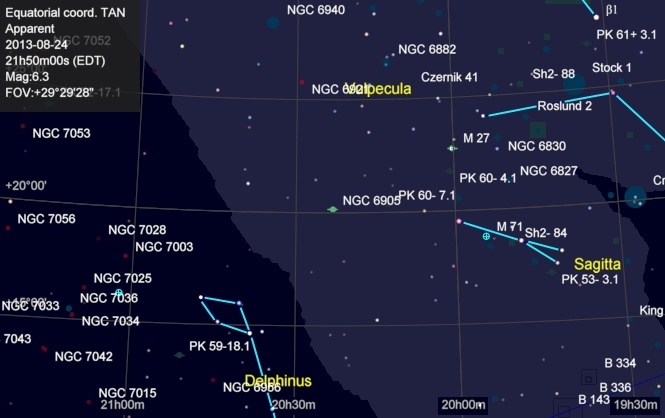 The nova sits just within the boundaries of the constellation Delphinus (indicated by the faint purple lines). As it will appear in most telescope mount “go to ” databases, finding NGC 6905 is a great way to get to the area of the nova quickly. I set out to a gravel parking area near the Bruce Botanical Food Garden on the east side of Ripley, Ontario, at 8:30 PM on the evening of Saturday 24 August 2013 to see if I could spot the nova. I had found this site the night before, and it proved reasonably quiet, and fairly dark, although there are some near-by houses a few hundred yards away. Some high clouds made the night of the 24th a little disappointing, and with moonrise set for 9:55 PM I knew I had to work fairly fast. I admit that I had trouble finding the nova with binoculars. I could see a fairly rich star field between Delphinus and Sagita, but really couldn’t decide if I was seeing my target or not. I reverted to the aid of SynScan on my EQ6Pro mount to save the day, and wasn’t disappointed – eventually. I did found the nova, but only on photographs after the fact. Looking through a 28mm eyepiece on an 8” Newtonian, I couldn’t be sure at all what I was seeing. So, I re-reverted to imaging. I set up a Nikon D800 body on the telescope, focused on a faint star using live view, and took a series of 30 second exposures at ISO 800. The nova turned out to be the brightest star in the frame, as expected. Actually, I spotted NGC 6905 first! The little blue ball was a charming sight on the photographs, and really stood out. I also have another admission, about NGC 6905. I didn’t know it was in the area of the nova until I saw my photos. At first I thought it was likely an artifact, but a quick check of the area on charts confirmed that in fact it was a planetary nebula, known as the Blue Flash Nebula. NGC 6905 is well worth a look on its own. It’s considered as a very lice planetary, and was discovered by William Herschel in 1782. This was another first for me – my first image of a planetary nebula. An added bonus for a night of nova hunting! The nova itself registered as a bright white star, bright enough to show faint diffraction spikes from the telescope’s secondary mirror spider. Nova Delphinus 2013 (left) and the Blue Flash Nebula, NGC 6905 (right), photographed on the evening of 24 August 2013 at 9:51 PM EDT, from the east side of Ripley, Ontario. North is approximately toward the left. The single 30 second photograph was taken through a SkyWatcher 8” imaging Newtonian telescope with a coma corrector, and a Nikon D800 body, set to ISO 800, on an EQ6Pro mount. This copy has been reduced down in resolution and cropped from the original frame. The two smaller images at the head of the post are from the same frame, without reduction in resolution. If weather and conditions permit, I recommend having a look for Nova Delphinus 2013. In the coming nights the moon will be rising later each night, and dropping in brightness, so this is a great time to try, while the nova is still bright. For southern Ontario Delphinus is nice and high in the sky after sunset. No reason not to go have a hunt for a truly rare sight! One of the joys of astronomy for me is the interplay between technology, science, creativity, and a fascination with the universe itself. From the beginning astronomers (amateur and professional) have been masters at make-do. You have an idea, well, then try it out? No equipment? Make something! There’s been a revolution in amateur astronomy in the past decade because of a new use for something never intended for that use. I have come back into astronomy as a passionate hobby via my other big interest, photography, and especially landscape photography. One of the drivers in photography is image size, and so cameras like the Nikon D800 with a 36 megapixel sensor, or its sister the D600 with a 24 megapixel sensor, or the similarly amazing Canons, seem to the wave of the future. RIght? Not so fast. There are limitations to “big sensor” imagers, and they really show up in astrophotography. For one thing they are expensive. For another, they miss the fact that for many kinds of astrophotography – especially photos of bright objects like the moon and planets – very large sensor arrays are at a disadvantage because much of the detail being photographed only covers a few hundred pixels. A response? Bust up a cheap web cam. Some very inventive people have found that not only can you make a working astronomy imager out of a web cam, but if you use it the right way and record a lot of individual frames with it – as an AVI movie, for example – you can then use software on your computer later to select the best individual fames and “stack” them – aligning and combining them to reveal details that were essentially spread out across the images, mostly by the movement of the air. One of my favourite stores is “Tiger Direct,” a big computer retailer in Ontario. I bought a 640×480 pixel web cam at the Burlington store for $19.99 plus HST, and proceeded immediately to break it, on purpose! The reading I had done about web cams for astronomy indicated that all that was needed was to get the sensor of the web cam to the prime focus of the telescope – exactly the same process as using a dSLR on a telescope, but via some creative improv. 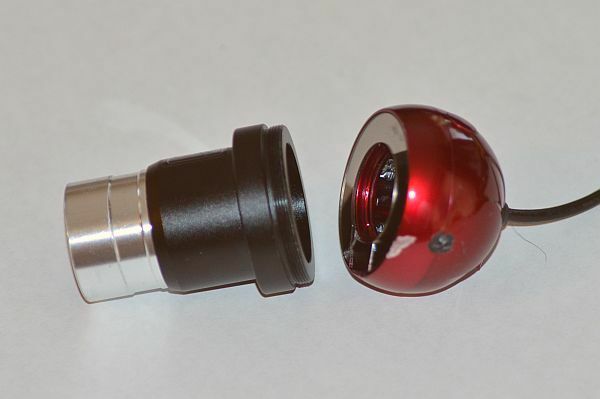 Some web cam gurus actually have created telescope adaptors that screw into a web cam and replace it’s original lens, which certainly would be a great way to do it. I figured that I’d try first with electrician’s tape. A 640×480 pixel webcam with the front plate and lens assembly removed. I also cut off a small bracket that would allow this model to sit on a desk or other horizontal surface. 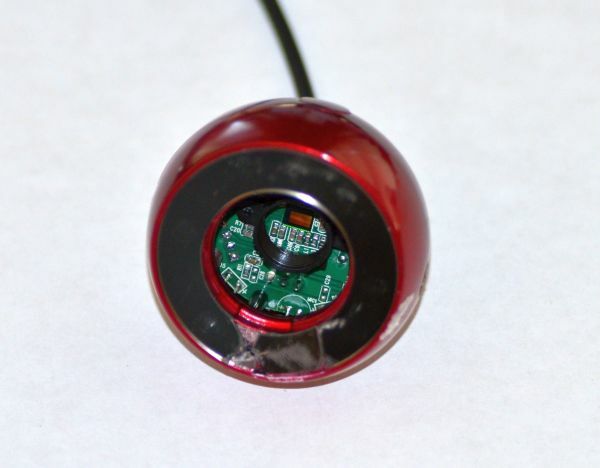 The lens was attached by being screwed into the small black barrel visible inside, mounted on the circuit board. The “business end” of the web cam. 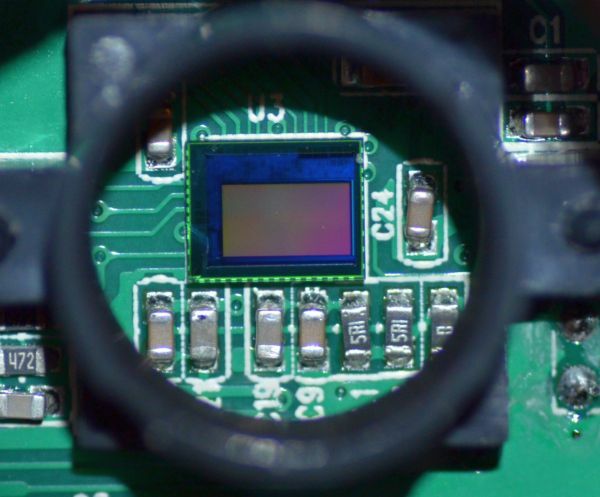 The sensor is the rectangle roughly in the middle of the image, mounted on a dark blue support and attached to the circuit board. The larger black circular structure is the support for the now-removed lens. Once the front plate was off, I could see the sensor and was very careful not to damage it in any way. Camera sensors are prone to picking up dust, so I gave it a squirt of air from a camera cleaning bulb, but otherwise let it be. I then lined up a 1.25 inch T-adaptor I had in my astronomy parts box. This is just a hollow tube that can fit in a telescope where the eyepiece would normally go. At the “back end” is a broad flange with threads so that it can be attached in turn to a camera adaptor. I wasn’t to interested in the threads – I just wanted a stable base to tape my web cam to. So , I did. 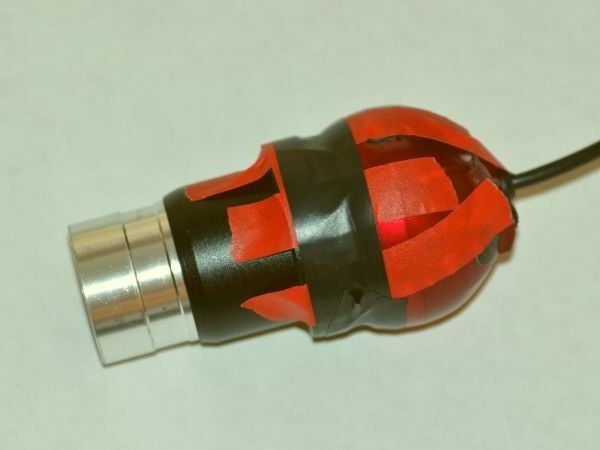 All that was required to make an astrophotography-capable web cam was attaching a 1.25 inch adaptor to the web cam, once the original lens was removed. Here’s a spare T-adaptor about to be attached to the web cam with tape. The assembled imager wasn’t exactly elegant. I held the web cam against the T-adaptor with tape, making sure to get the two surface to match up as flat as possible, and that no light could come in from the sides. The silvery 1.25 inch barrel at the left was put into a telescope in place of an eyepiece. Once taped up, of course, the big question was “would it work?” There was only one way to find out. On the night of Friday, 16 August 2013 the moon was a nice sight over Dundas, Ontario, from my west-facing apartment balcony. I set up my Meade 125TB Maksutov-Cassegrain telescope on an EQ6Pro Synscan mount. These are two fairly sophisticated pieces of kit, admittedly. The Meade telescope has a focal length of 1,900 mm and has been a favourite of mine for lunar as well as solar observing and photography. The mount is very heavy-duty, rugged, and accurate – overkill, really, for this telescope, but in a lot of important ways, the mount makes the system. As I set this all up on my apartment balcony I also had another strike against me. I don’t have a view of Polaris from the only place I can set up the mount. So, all I can do is set up an approximate polar alignment, sight a few stars for Synscan to attempt to refine the alignment, and go for it! 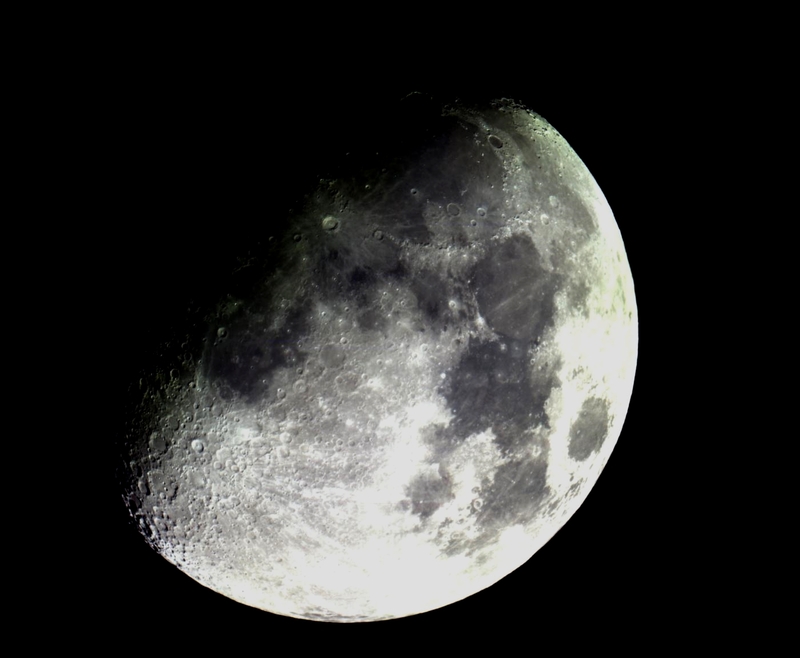 A portion of the northeast area of the moon, photographed 16 August 2013 at about midnight, from an apartment balcony in Dundas, Ontario, with a $20 web cam (mounted on a somewhat more expensive telescope). 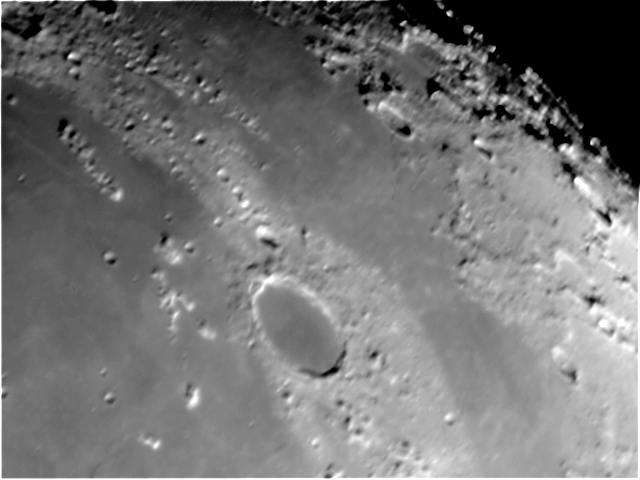 Visible in the middle of the image is the crater Plato. To its left is Mare Imbrium (the Sea of Showers) and to its right (north) is Mare Frigoris (Sea of Cold). This is a single fame captured by the web cam, without subsequent processing other than a slight adjustment for contrast and brightness. I was pretty excited to see the detail coming from this little camera. At just 640×480 pixels it’s a small imager, but it can produce very interesting results. I have not yet started any serious attempts to use this to produce “stacked” images, but I’ll try that next. There is a free program called RegiStax that has been written specifically to process AVI video files and BMP individual frames of astronomical subjects recorded with web cams. I recorded some AVI video that night, and will to have a go at processing it with RegiStax some time soon. I’m a little skeptical at the moment, however, because of what appears to be a lot of “seeing” – air movement causing ripples in the images. We’ll just have to see how that turns out! For now, I’m quite pleased with this little web cam and what it can do. 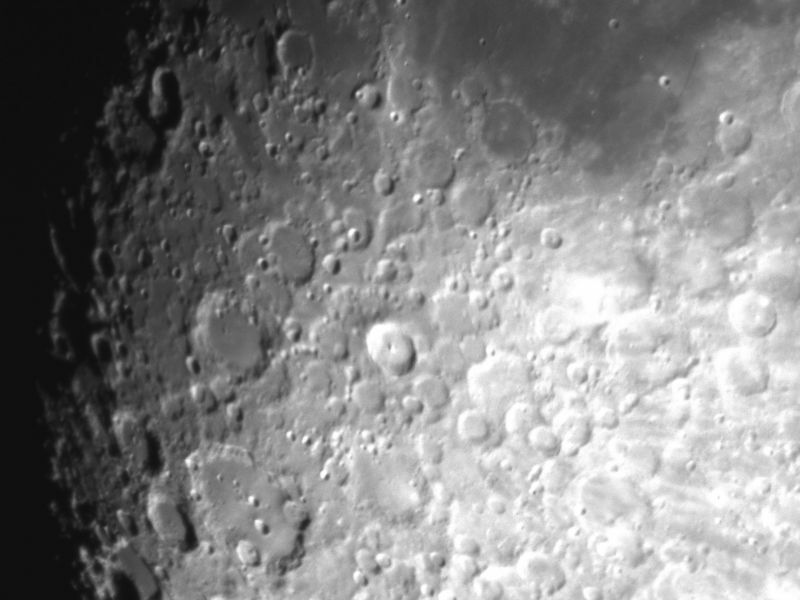 A region of the moon’s southern highlands, imaged with the web cam. This is one frame from an AVI video I shot on the night of 16 August 2013. The bottom third of the prominent crater Clavius is visible at the top centre of the frame. I like to say that what we see depends on how we look. No matter how much we may think that a photograph is a “real image” and what you see is “just they way it looked,” photographs are always interpretations, full of assumptions, conventions, and the ever-present interplay among art, technique, and technology. This is particularly true in astrophotography. Even the stunning images taken by telescopes such as the Hubble Space Telescope are actually highly artificial. Not only do they represent magnifications far beyond what our own eyes can achieve, they also are made possible by gathering light from fantastically feint objects. Furthermore, they usually represent an artificial spectrum, a selection of colours represented on the image that are not the “natural” appearance of an object at all. Astrophotographers, artists, and anyone else working with these images can select various wavelengths of light that were captured by the original camera and transpose them into what we see in the final image. Two faces of the moon. A High Dynamic Range image made by combining three photos taken on 14 June 2014 at different exposures. The sunlit side, on the right, is many times brighter than the earth-lit side on the left. Photographed with a Nikon D800 body on a Meade 125TB Maksutov Cassegrain telescope, on an EQ4 motorized mount. The earthlit side was exposed at ISO 800 for 10 seconds. The sunlit side consisted of two shots at 1/3 and 1/30 second. The three images were combined with Dynamic-Photo HDR. The moon on the evening of 14 June 2013 – with both bright side and earthlit side represented in an HDR image. At breakfast at a B&B in Arizona on the 1st of June, 2013, conversation ran to the use of airborne telescopes. NASA has long used astronomical telescopes mounted on aircraft. Most recently, SOPHIA (the Stratospheric Observatory for Infrared Astronomy) has been flying about in a converted 747. SOPHIA boasts a 2.5 meter reflecting telescope, and flies high enough that infrared astronomy becomes possible. In the days preceding this chat, during my recent trip through Arizona with astronomy on my mind, a nice alignment of three planets had taken place. Mercury, Venus, and Jupiter have all been grouped more or less in a line visible just after sunset. I went out several times during my trip to see this lovely sight and get a few photos. On the way home from Arizona to Ontario, I happened to be in a west-facing seat on a jet between Detroit, Michigan, and Toronto, Ontario, flying between 9:50 PM and 11 o’clock or so on the evening of 1 June 2013. 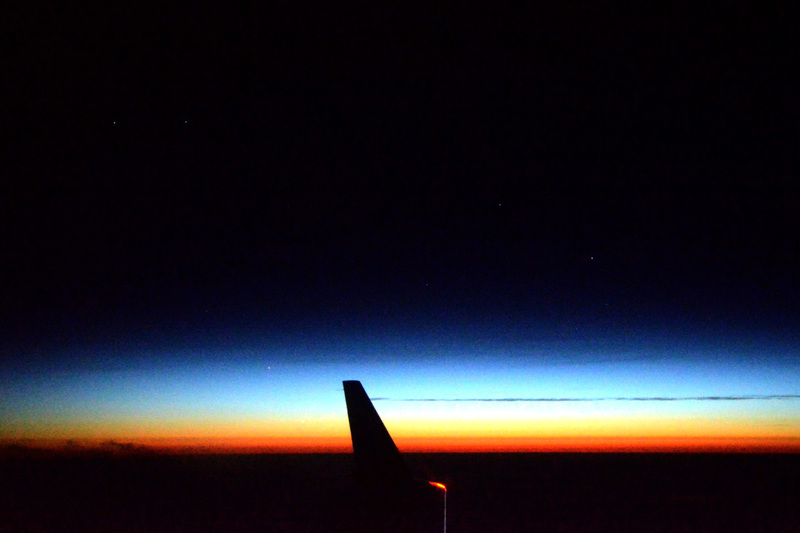 I was thrilled to see some of the planets still above the western horizon during this flight. Jupiter had just set, but I managed to get photos of Mercury and Venus, and even picked up some of the surrounding stars in Gemini and Aquila, too. My mind flashed back to the breakfast conversation of the day before. The stars are a little hard to see on this reduced copy one of a series of photos taken on the evening of 1 June 2013. The view is from a Canadair Regional Jet looking out the left side of the plane. The middle of the view is a little north of west. The vertical fin is a winglet that decreases wing-tip turbulence and increases efficiency. Photographed with a Nikon D800, f/3.8, 1/13th second exposure, ISO “maxed”, at 29mm focal length on manual focus. 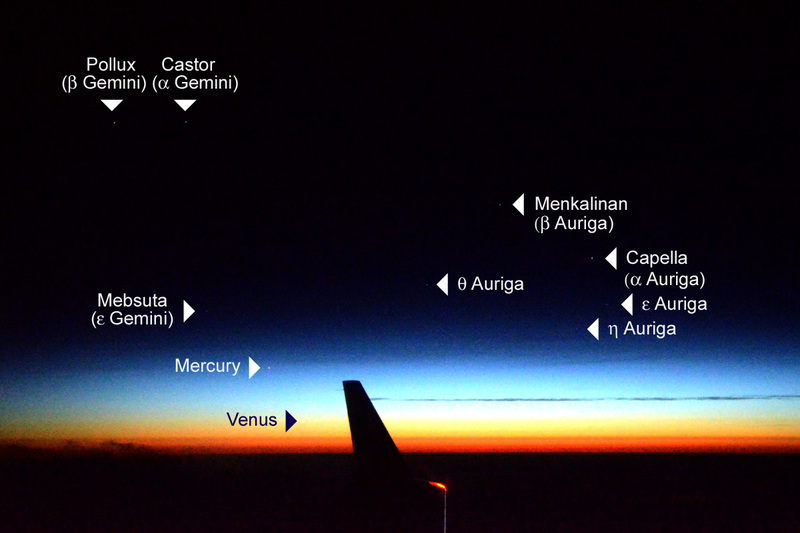 Venus, Mercury and an assortment of stars were visible – and photographable – from a regional jet flying between Detroit and Toronto on the evening of 2 June 2013. I confirmed identities of the stars and two planets visible at this time, from this direction and altitude, using Stellarium, a wonderful free planetarium program. Venus is about 12 degrees north of due west in this image. Jupiter would have set a little while before this, roughly under the trailing edge of the wing. Please click on this image to see a larger version. In these versions of the photo, Venus is hard to spot, and even the stars are not nearly as obvious as they are on the original, much larger image. I cropped out a section of the original image file, and adjusted the contrast and brightness to show Venus a bit better. Hereès the edited image, which is not reduced in resolution at all from the original D800 photo. The colors have also not been modified, but appear more intense because of the changes to brightness and contrast. 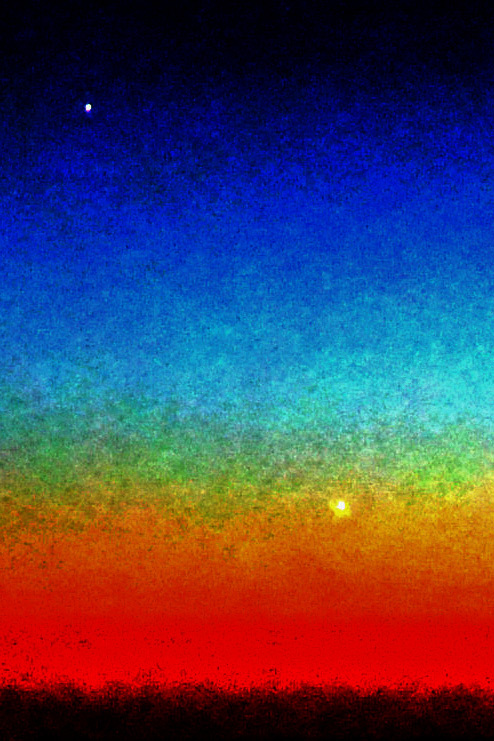 Mercury (top) and Venus (bottom) from the same frame as above. Might make a great wall-hanging! My photos from a jet liner don’t compete of course with real airborne astronomy. However, its reassuring to know that the night sky sometimes can be there fore you even when you don’t quite expect it. Even at 10,000 meters. Arizona’s motto is the Canyon State – which is great. Canyons are cool. It’s also an astronomer’s dream. They sky is clear much of the year, and many areas are at a high elevation, too. 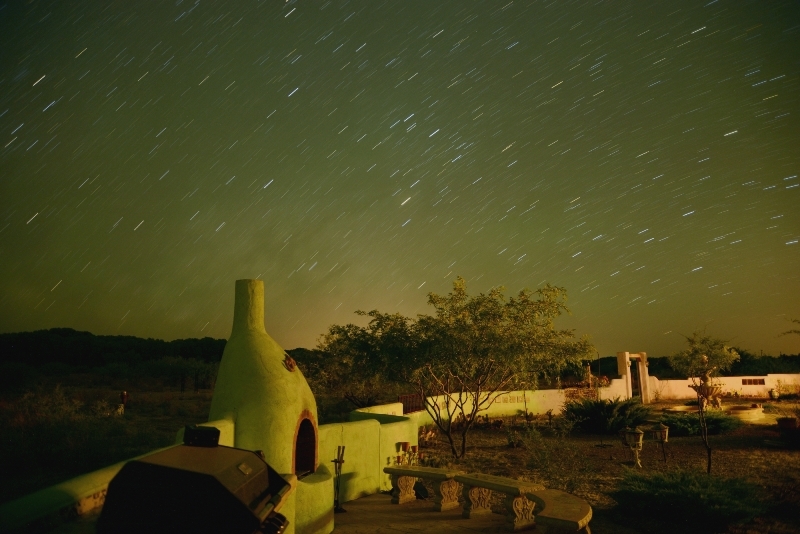 Several prominent observatories are located in Arizona. Here are a few of my early results. Scorpio rising over the BBQ. At the back of the Down By The River B&B, south of St. David, AZ. 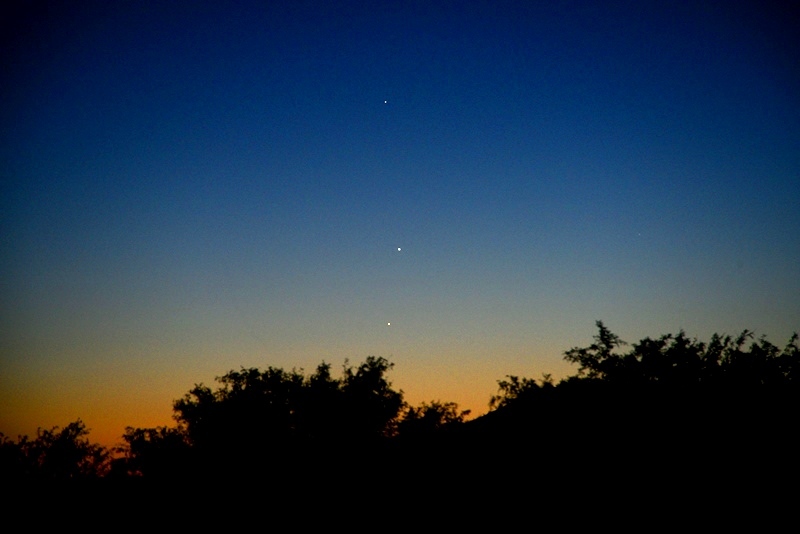 Mercury (top), Venus, and Jupiter together just after sunset on the evening of 29 May 2013. South of St. David, AZ. 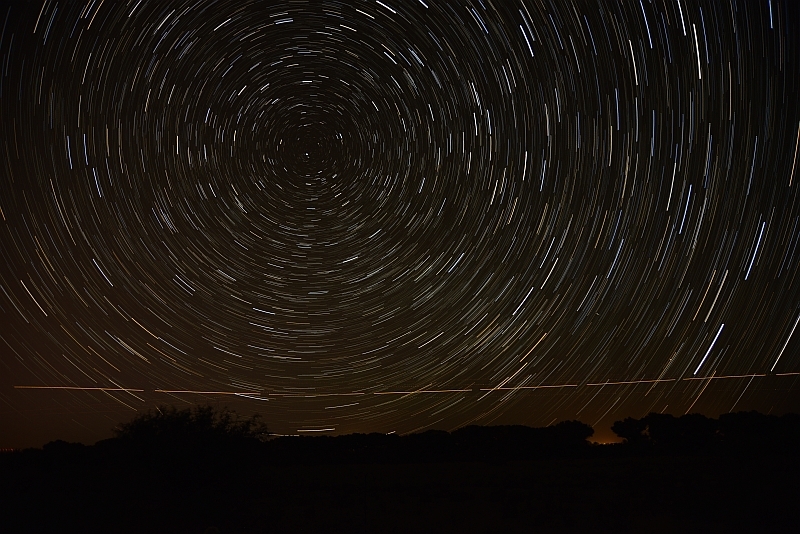 A 27 minute star stack image taken from south of St. David, Arizona, on the evening of 29 May 2013. 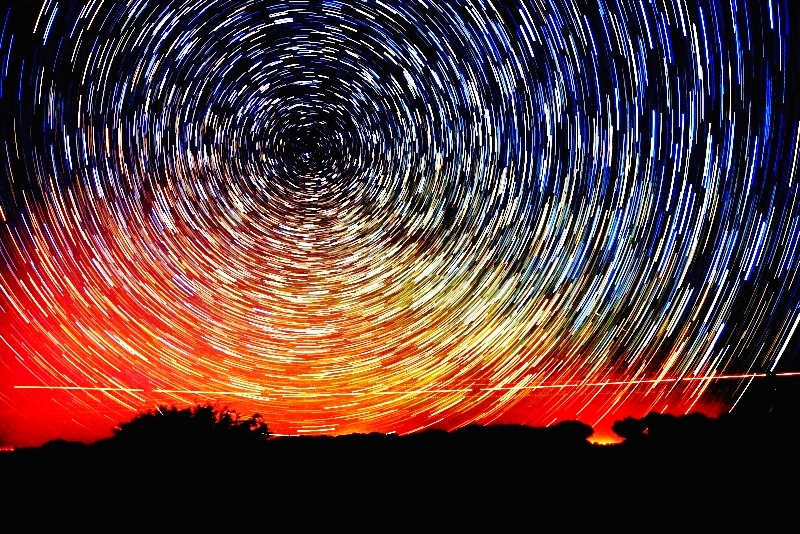 A total of 52 individual images, each 30 seconds long, were stacked together using StarStaX, a free program. Taken with a Nikon D800 and 24-120 mm lens at 24 mm, ISO 1000, f/3.5. I was having a little trouble getting the internal timer on the camera to work, so this series was taken by hand with a cable release. This copy is reduced down in size by about 90% in both directions. See below for a cropped portion at the original resolution. The area around Polaris itself. 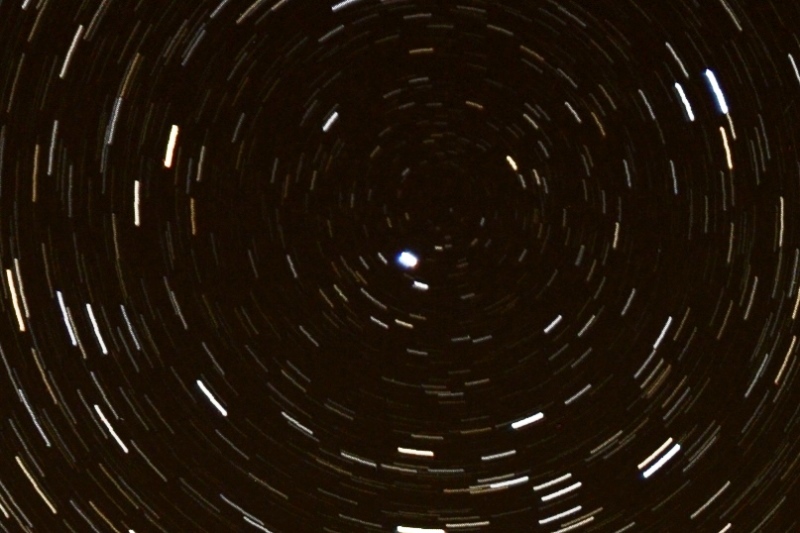 Note that the centre of rotation is not right on the north star – the pole is a little less than one degree to one side of it. This section of the image above is cropped down to 800 pixels wide, showing the detail on the original image. “Red, White, and Blue.” A little playing around with colours, brightness, and contrast on the image above. Sort of the Time Tunnel meets Van Gough. I’ll post more as I’m able to catch up with things!